Thinking back on our time together, I realize that I should have anticipated the course of his life and career. After all, Goedel was always interrupting everyone. He wouldn't let anyone complete a sentence, let alone a thought. 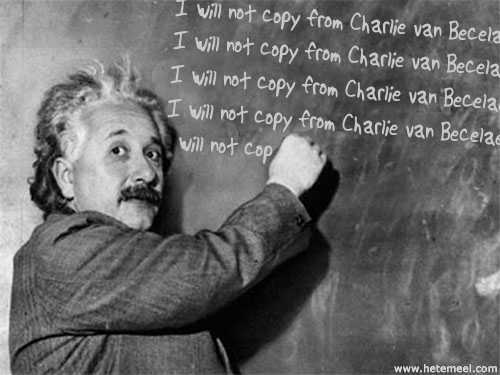 Einstein, on the other hand, had no such conversational trouble; his main social faux pas revealed itself in other ways. He had, as most of you probably know, an abiding, consuming hatred for all things associated with quantum physics. In fact, many were the children who bore the undeserved brunt of the wrath of Einstein (in fact, some of them called him Dr. Frank Einstein - even occasionally to his face!) simply because they were found to be playing board games in his presence. "Ach!," he would declaim, "God does not play dice with the Universe!" Then he would take their dice and fling them into the fireplace, the grass, the waste basket, even the toilet, then stomp away, muttering just under his breath, "I must finish my unified field equations soon ...."
It is a little known fact that this behaviour caused Einstein to be barred from entering the city of Las Vegas, as well as being declared persona non grata in Monte Carlo by the Prince of Monaco himself. Somewhat better known, although not universally acknowledged, were the personal hygiene habits (or the lack of said habits) of Prof Pauli. A brilliant man - none could dispute that - but his olfactory sense must have been defective. Pauli could go many months without bathing. Again, I suppose I should have anticipated some of his discoveries, just from having ridden public transport with him. His personal "aura" tended to get him exclusive seating on the bus - in any case until all the other seats were at least partially occupied. It's not that we were out to exclude Pauli, but he tended to rule his own bus seat for longer periods than the rest of us (especially me).